Level sensors are one of the largest applications for sensor technology in the world today. Currently, industries use several different types of sensors to detect levels of fluids and help stop overflows. These sensors may be used to measure the level of fluids in a container or in a natural environment such as a lake. Fluid level measurement occurs in several ways. In the immersion method, for example, the capacitance of the sensor circuit changes as it is immersed in fluid, thus changing the frequency response as the fluid level rises or falls. Fluid level can also be measured from the outside of a non-conductive container. The response frequency from the sensor is dependent upon the inductance of the container plus the combination of fluid and air inside it, which corresponds to the level of liquid inside the container. Other types of more efficient sensors that are used by industry, such as optical level switches and magnetostrictive tank-gauging switches, offer high accuracy but at higher costs. Over the past several years, iRAP has examined the sensor technology industry. Within this period, sensors technology used in level measurement has taken diverse configurations. As a consequence, the use of this technology is changing with time. Therefore, this report contains a thorough and detailed analysis of this technology and projects its growth potential. According to the new iRAP report, S101-‘Level Sensors – A Global Industry, Technology and Market Analysis’, the 2012 global market for level sensors was estimated to be $2.7 billion. The market is estimated to reach $3.8 billion by 2017, showing a compounded annual growth rate (CAGR) of 5.5% per year. From a regional market perspective, The Asian region is expected to exhibit growth that exceeds some of the world’s most vibrant markets of the Americas and Europe from $915.6 million in 2012 to $1.24 billion by 2017 with a rate of 6.2% annually. This exceptional growth trend is expected to prevail throughout the dynamic markets of the Asian region. This study also reveals that Europe will experience reasonable growth of an estimated 5.0% in the demand for level sensors from $725 million in 2012 to reach $927 million in 2017. The intensity of demand for flow devices in Europe is expected to be quite significant. The America’s flow level sensor market, led by the U.S., is expected to be the most dynamic market in the coming years, exhibiting a strong market growth phase. 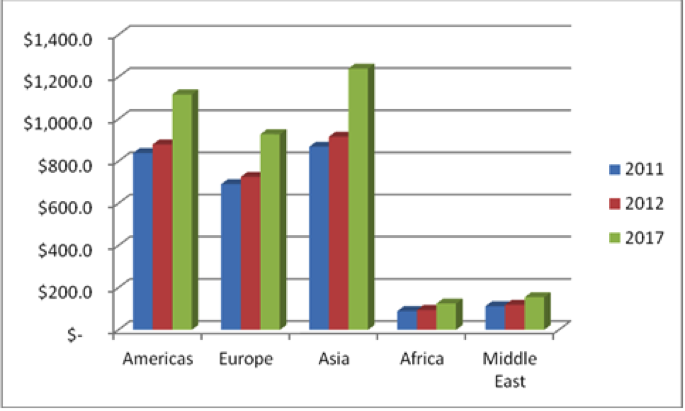 The overall level sensor market in The Americas is expected to grow from $879 million in 2012 to $1.1 billion in 2017 with a grow rate of 4.9% annually. Among sensor types, the largest share goes to ultrasonic sensors, followed by hydrostatic. The third largest goes to a combination of capacitance, RF and conductivity sensors followed by radar sensors. The remaining goes to all other types of level sensors. Ultrasonic sensors will see the largest growth rate among all level sensors.